Use these front yard landscape designs to get ideas for your own oasis of color and appeal for your front porch and yard. 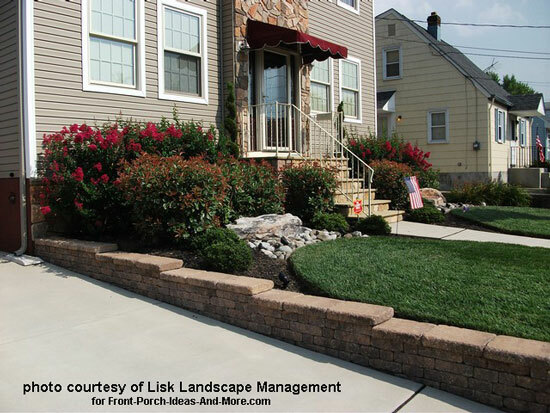 Mary and I are honored to have Lisk Landscape Management share their free landscaping ideas to help you create stunning outdoor spaces. 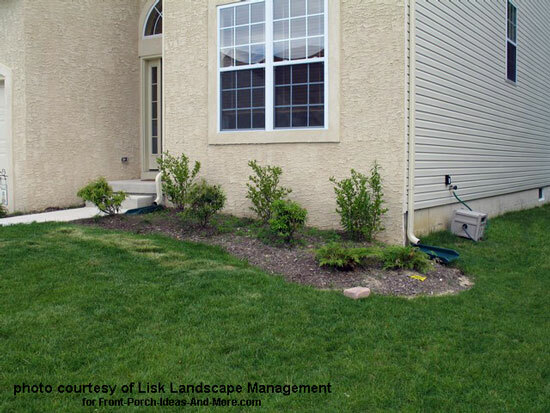 As a premiere landscaping company for planting zones 6 and 7 in the New Jersey area, the folks at Lisk Landscape Management share these landscaping home photos to give you inspiration for your yard. 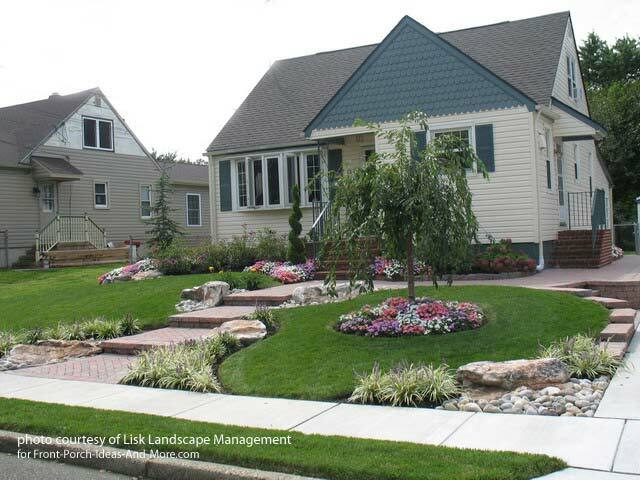 Their front yard landscape designs could be used in most locations. We've included a landscape plant guide below to highlight the plants that Lisk used for the projects we've featured for you. 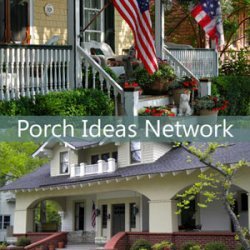 Welcome to our Porch Ideas Network where we feature porch construction companies to share their inspiring ideas. Also, enjoy our podcasts where we've interviewed experts who bring you insider tips and smiles. 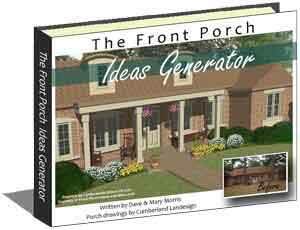 Mary and I know how landscaping can visually enhance the look of any front porch. 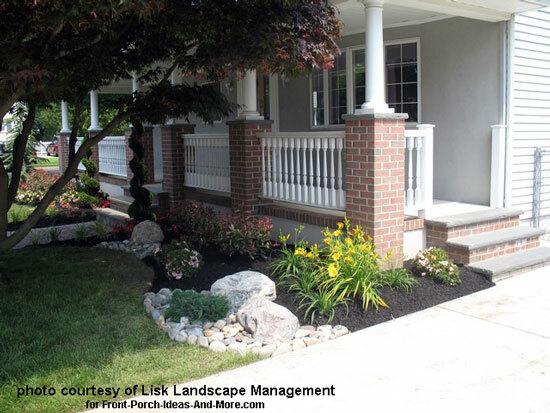 The combination of the right plants and hard scape helps to create appealing front porches and lots of curb appeal. 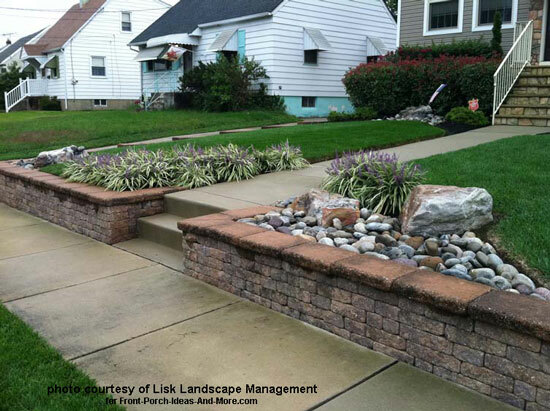 These landscaping photos, landscape designs, and ideas are courtesy of Stephen at Lisk Landscape Management. Let's start with small yard landscaping ideas. 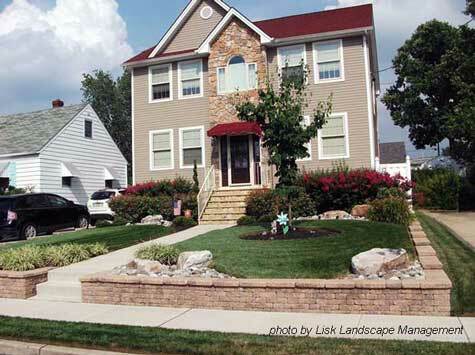 There are lots of folks who have small front yards or small spaces in which to landscape. 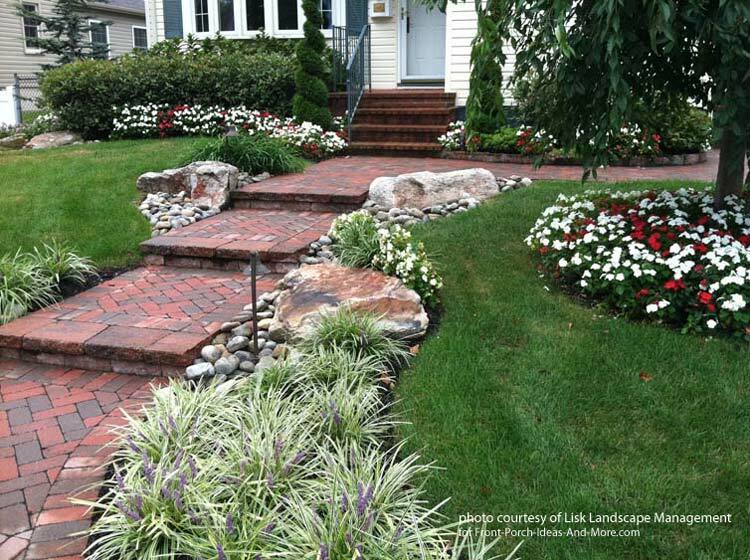 Even if you have a small front yard you can create amazing landscaping designs. 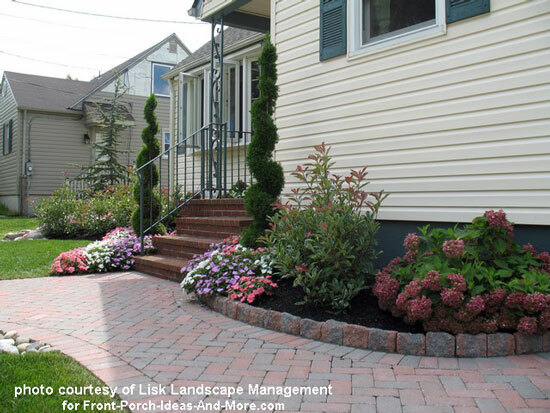 Use the right plants and hardscapes to turn the ordinary into something quite appealing. What Would You Do to Improve This Yard? Yes, it is the same house. It is really amazing how the right front yard landscapes can turn something ordinary into a curb appealing work of art. This makes "coming home" after a hard day a work a whole lot more satisfying. 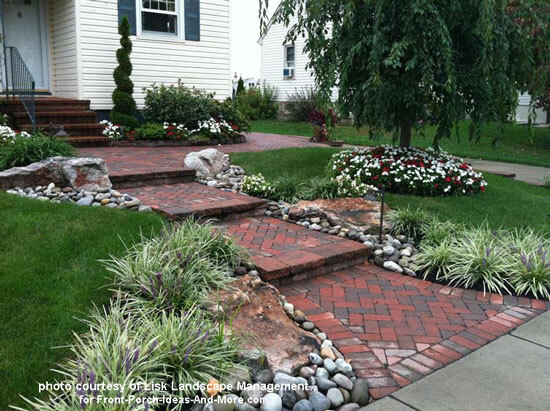 Let's take a closer look at what Stephen did to create this almost botanical garden in this homeowner's front yard. This feature may not work on mobile devices. Take special note of the new sidewalk with a herringbone pattern. This adds lots of interest and the design complements the plantings. 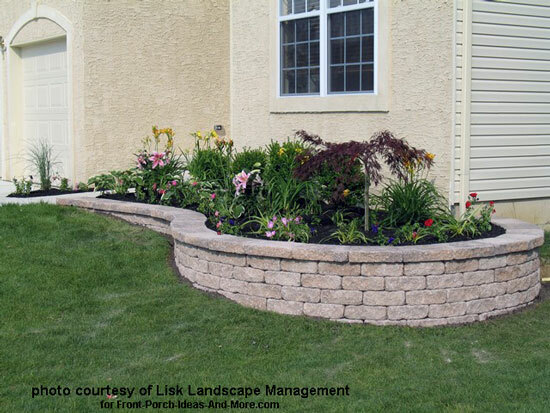 The rock edging gives the landscaping visual stability while the plant selection and colors give it real appeal. Stephen decided to use EP Henry Coventry Brickstone in the color of Autumn Blend with matching Autumn Blend Edgestone to prevent mulch from eroding on the sidewalk. Stephen uses Autumn Blend in particular to match the existing brick steps. The tumbled look of the block gives off a natural aged/rustic look. The brick walkway and retaining wall below extend the front yard landscaping around the side of the house. The steps give this small home a sense of sophistication - a real nice touch. Hardscape, that is, rocks, bricks, pavers, etc., often have a very linear effect. 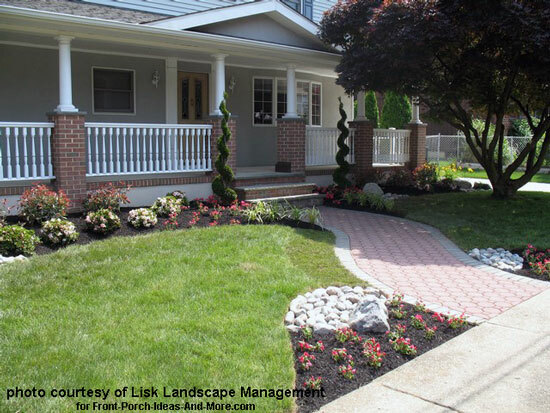 Stephen, owner of Lisk Landscape Management; however, softened the look by offering a short herringbone pattern sidewalk leading to the steps and then curving the retaining walls inward. In the initial layout, the side entranceway was too small and very difficult to walk through. A natural flowing, easier accessible walk was the solution. 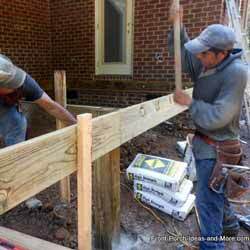 To accomplish this, Stephen and his team precisely cut and level out the wall blocks on a crushed stone base. Stephen decided that an EP Henry Coventry Garden Wall in Autumn Blend would be the best choice for the overall design of the project. This choice was more cost effective than the traditional Coventry Wall and a 4 inch block was better suited for the layout. After the step construction was completed, Stephen gradually stepped down the retaining wall with the grade along side of the driveway to a boulder and some small plantings. To break up some of the landscaping and add to the natural look of the hardscaping, Stephen decided to add matching “Jericho Boulders” along with 3 to 5 inch river rock. In addition, variegated liriope and stella d’oro daylilies were used around the hardscaping to soften things up. Path lighting was used to illuminate the beautiful entranceway at night. The original steps were very old and out of date. In addition, there wasn't the correct amount of steps leading up the entranceway. Stephen and his team knew this was something that needed to be corrected before moving forward with the overall appearance. No matter if you are moving into a new home like the one below or have been there a while, good front yard landscape designs can add a bit of sophistication to an otherwise ordinary yard. What Would You Add First? A bare lot is like a blank canvas. Sometimes it can be difficult to imagine the possibilities. When Stephen initially met with the homeowners, they were unsure of what direction to take the design plan with the exception of not wanting the responsibility of cutting the grass on the small hill. Stephen; however, had the perfect idea in mind and sketched his landscaping plan that you will see here. The new concrete driveway, walkway, and steps were installed prior to all landscaping and hardscaping. What most of see as ordinary, Stephen sees as possibilities. This could have easily been landscaped without the retaining wall but look how well it not only frames the home but also makes it appear more sophisticated for a more formal look. The awning over the front door not only protects visitors from the elements but also extends colors from the yard onto the home. Notice how the landscape colors, the awning, and roof shingles all complement each other. This landscaping design made this home look absolutely magnificent from the unique colors in the garden wall, to the texture on the boulders and the beautiful crape myrtle shrubs. What Condition Is My "Soil" Condition In? Matching soil conditions to specific plants is vitally important to plant health and growth. Soils in southern New Jersey are fairly acidic due to the amount of evergreen needle decay over the years. For the majority of locations in southern New Jersey, choose acid loving plants like rhododendrons or azaleas. Or, mend the soil by adjusting the pH levels to accommodate more alkaline loving plants. You can achieve the right alkalinity by adding lime or make it more acidic by adding sulfur. It is important to test your soil at least once every three years and adjust accordingly as soils tend to change over time. 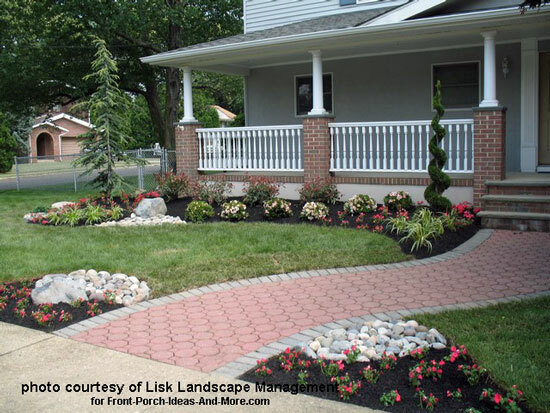 The right front yard landscape design can truly enhance the look of your front porch and home. 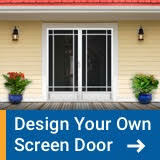 Ultimately, you want your landscaping to become a transition from the outside to the your front door. It should be pleasing to the eye and complement your home's style. 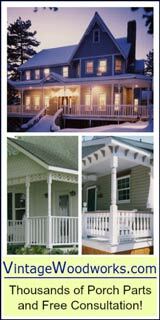 Above all, you don't want it to overwhelm your home or porch. Mary and I like the subtleness of this landscape design. Along with the beautiful walkway, it adds lots of color, clean lines, and gives the home and porch a real welcoming feel. 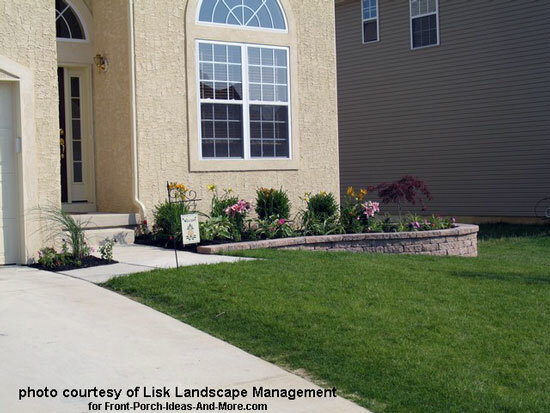 Lisk Landscape significantly enhanced the overall appearance of this front porch with just with a few unique plantings. Although we don't have a before picture to show you, Stephen decreased the overall bed size, specifically removing the mulch beds along the walkway and replacing them with tall fescue sod. We love the gently winding paver walkway. Such a nice difference from a straight concrete sidewalk. Stephen shows us how he uses landscaping to make a front porch more appealing. You can have a most awesome front porch but without the right landscaping it's like having a cake without frosting. 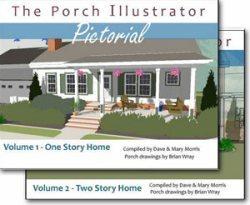 Now that's a porch you can easily furnish, decorate, and enjoy. See what a difference the right landscaping makes? 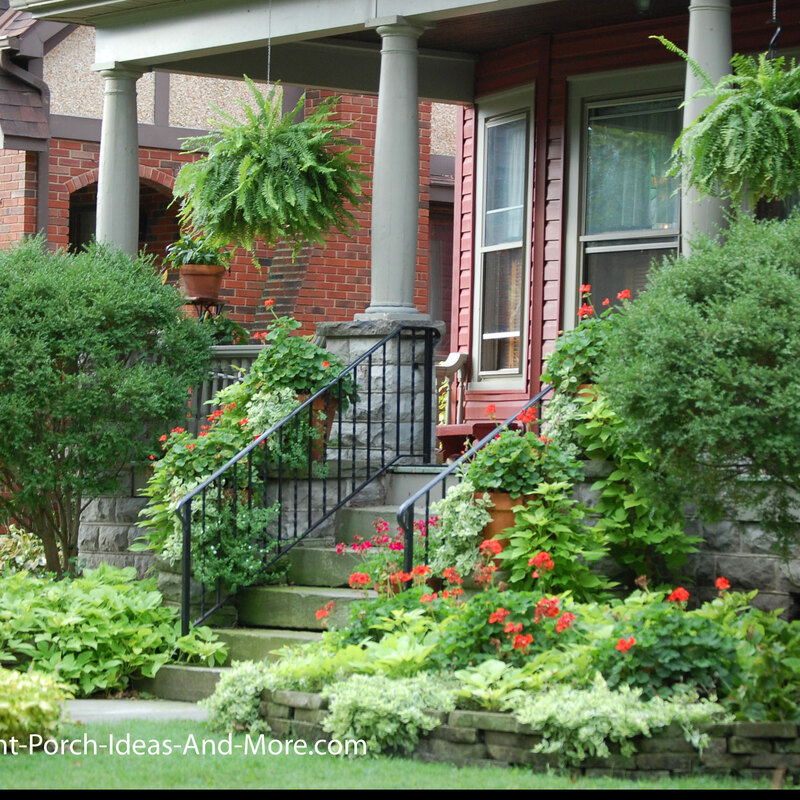 Front yard landscaping is critical to having a beautiful front porch. Stephen chose lower growing plants and perennials (besides the Weeping Blue Atlas and the Arborvitae Spiral) so that he didn't take anything from the stone veneer on the landing atop of the steps. 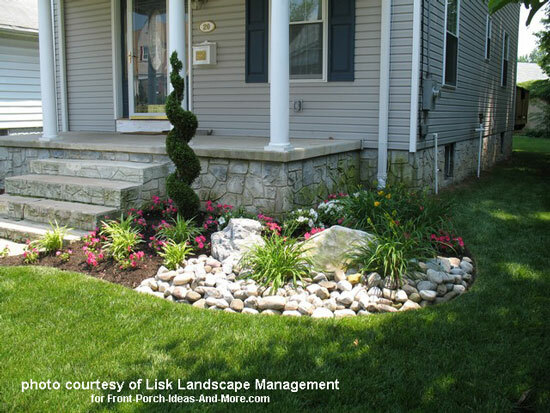 The balance of the natural river rock boulders and river rock with all of the colorful plantings, makes this front yard landscaping idea terrific for a small front porch. Stephen offers an ideal solution to a typical landscaping problem. How do you turn a humdrum planting area into something that adds lots of pizzazz? The homeowners were looking for a properly leveled out planting bed and also something to help prevent the mulch from washing into the grass during a heavy rainstorm. The homeowners got their wish and a lot more! It’s amazing what a little bit of hardscaping and small plantings can do for a small yard landscape. 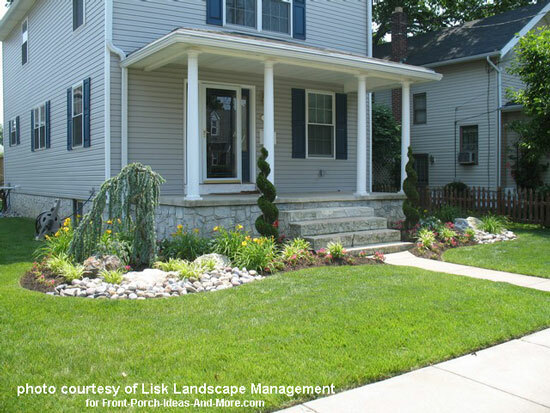 This front yard landscape design now adds additional beauty to the front of this home. The homeowners are thinking about adding an 18 to 24 inch paver extension along the side of the driveway to improve better access while entering or exiting their vehicles. 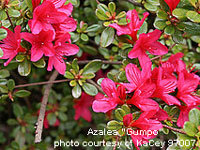 Gumpo White or Pink Azaleas can reach heights of 3 feet when fully grown. They usually have a three foot spread. They tend to sprawl a bit but have a one foot clearance from the ground. Although a slow grower, they have a lifespan of 40 years for more. We have azaleas around our front and back porch. Victor Red is a dwarf variety that is ideal for smaller spaces. You can expect it to grow to both 4 feet tall and 4 feet wide. Perfect for edging and borders or if a low hedge is desired, dwarf boxwood being a compact evergreen, is an excellent choice. Keep it under 1 foot or it can be allowed to grow as tall as 3 feet. 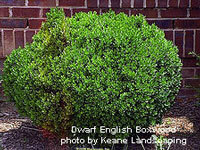 Ideally, dwarf boxwoods prefer cool, well drained, but moist soil. 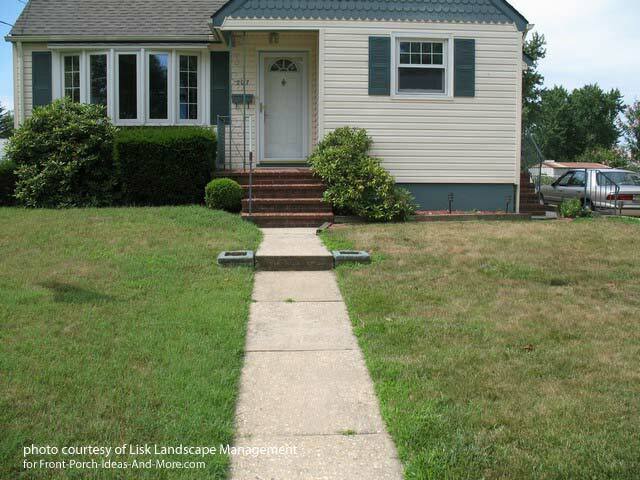 A perfect choice where space is limited like next to porch steps as an example. This tall but spiral shaped evergreen has dark, emerald green foliage. A little pruning is required to maintain its shape. This native New Jersey biennial herb has fragrant yellow blooms from July until the end of September and can grow to heights from 1 to 3 feet. It likes sandy, rocky, or poor dry soil. 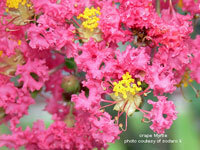 It is easy to grow in areas receiving partial shade to full sun and attracts hummingbirds and insects seeking nectar. Impatiens are usually short plants and grow to a height of a foot or less. Some varieties are very short. 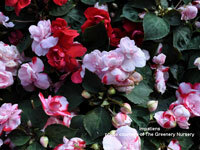 Popular, impatiens flowers come in several different colors: white, red, pink, violet, coral, purple and even yellow. 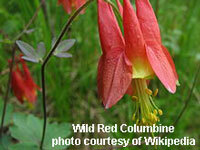 They are usually easy to grow and provide abundant color around your front porch. They do best in shady areas. This ground cover grows to about 12 inches tall when fully grown. It can reach up to 18 inches tall when flowering and can spread 10 feet. Because it is a ground cover, it does not require plants in front although you have the option to do so. 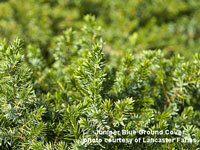 It is a fast growing shrub and can thrive up to 20 years. 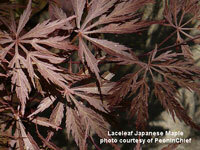 Japanese Maple are home shaped and have a cascading foliage to create a low canopy that to within two feet of the ground. This dwarf tree does best in full sun to partial shade and has a spread of about 4 feet. Grow in average to moist conditions and does best in rich soils. 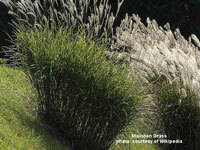 Maiden grass will grow to about 4 feet high and can spread out to 4 feet. Best when planted with low growing perennial plants. A medium growing plant it can thrive for for approximately 20 years. It forms dense clumps of graceful grass and prefers full sun, but it will grow in moderate shade. 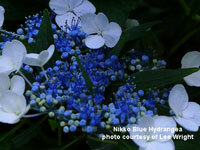 The most common hydrangea, the Nikko Blue grows to be about 5 feet tall with a spread of about 5 feet. Flowers will be blue in acidic soil but tend to be lighter or even pink in alkaline soil. They should be watered on a regular basis. Oriental lilies like acid soil and have enormous fragrant flowers that bloom in summer. Fast growing, They can reach to about 24 inches tall and spread to 18 inches. 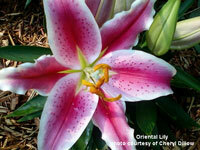 Oriental lilies have a typical clearance of 1 foot which allows for under plants with lower growing perennials. America's favorite, petunias bloom a long time and come in many different colors and types. 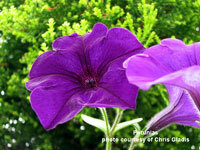 Petunias grow to between 4 and 18 inches and spread from 18 inches to 4 feet. 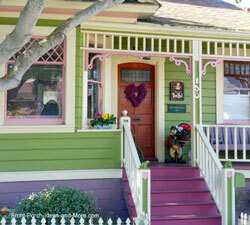 Use to create massive color for your front porch and yard. This shrub can reach 15 feet high by 15 feet wide. You can use this a privacy screen, for borders, or as a protective hedge. The Red Tip Photinia has variegated foliage in deep, rich shades of red, green, and burgundy. 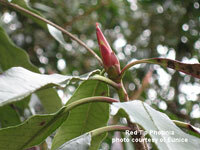 The Red Tip has creamy white flowers in late spring and continues throughout the summer. 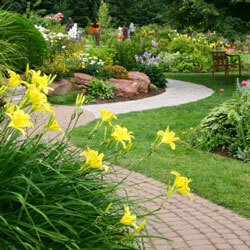 One of the most popular day lilies as it grows so well in all zones and can flower for months. 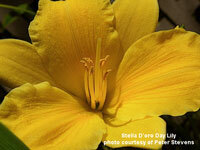 The Stella D'oro Daylily has dense clumps of grassy green foliage and golden yellow flowers. Perfect in front of front porches or place in mixed containers and tubs right on your porch. Your perfect shady ground cover or edging plant. 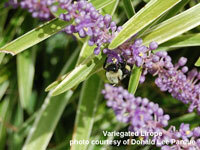 This evergreen perennial has striped leaves and violet purple flowers. 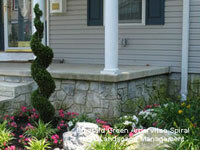 The semi-evergreen leaves are almost indestructible and look great year round. It loves partial to full shade and is perfect in locations where other plants do not like. Use them under shade trees or beneath larger shrubs. These make perfect accent trees for corner landscaping. They are large, growing slowly to be about 50 feet tall with a spread of about 40 feet. 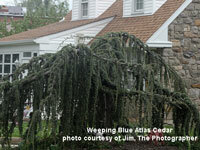 Its characteristics include drooping, twisted branches containing powdery blue needles and is definitely a specimen tree. 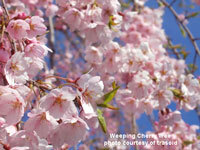 This lovely tree puts on a spectacular show in mid to late spring, when small, beautiful rose pink or white blossoms. Very popular, it grows to be 20 to 30 feet in well-drained acidic soil. This tree is more ideal for larger areas either in the front or back of the yard. 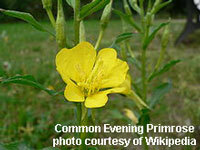 This common New Jersey plant will flower from February through July with pink, red, and yellow flowers. It grows from 1 to 3 feet tall and prefers moist, well-drained, sandy soils. Once established, they are can tolerant drier conditions. A list of what Lisk Landscape Mgmt used in their projects we featured above. EP Henry 3" Coventry single sided wall in the color of Harvest Blend. 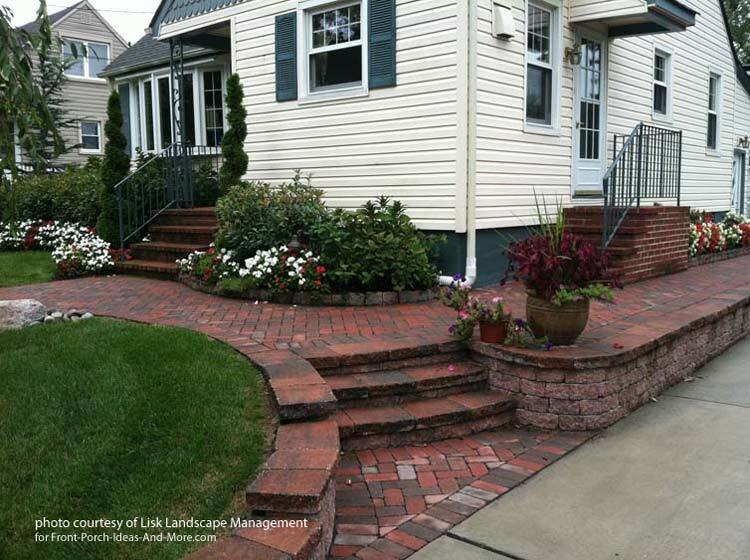 EP Henry Octa Grande walkway pattern in the color of Autumn Blend w/ a 4x8 Brickstone Border in the color of Pewter. 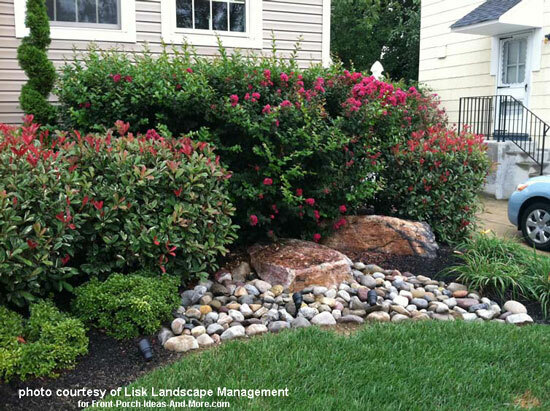 We appreciate Lisk Landscape Management sharing their pictures and expertise with us. 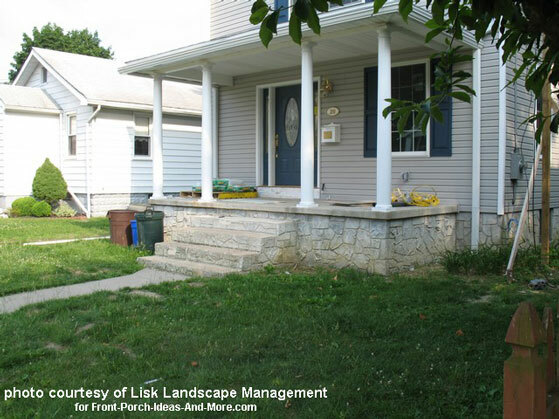 The before and after pictures depict the importance and beauty of a wonderfully landscaped porch and front yard. Lisk Landscape Management is based in Mt. Ephraim, NJ. 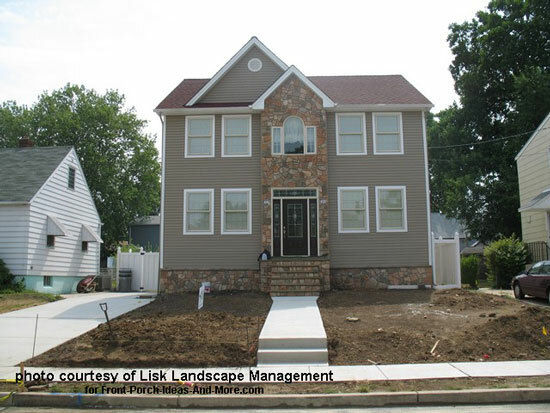 Lisk Landscape provides a unique blend of design, installation, and maintenance services. Stephen Lisk, owner and master designer, began offering residential lawn maintenance and snow removal when he was only 13. 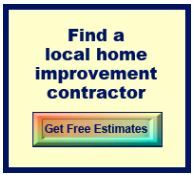 Today Stephen's team provides the utmost integrity and service excellence, whether in designs, installation, or maintaining your outdoor areas. Stephen writes: "I started Lisk Landscape with the intent to create exquisite outdoor environments that would inspire clients for years to come. I’m very passionate about what I do, and enjoy each and every challenge that landscape architecture brings me. I also like to provide unique landscape elements and construction techniques that our competitors simply cannot offer." 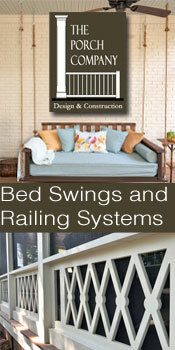 Want a beautifully designed yard to enhance the look of your porch? 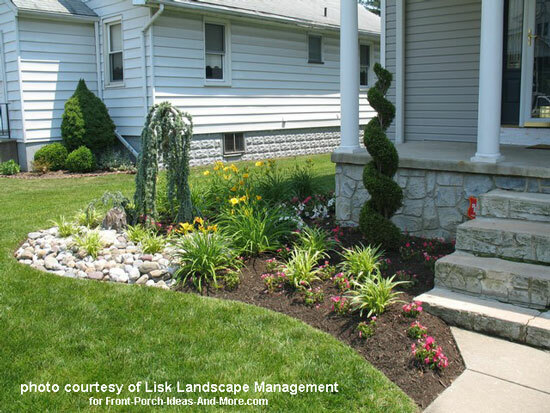 Contact Lisk Landscape Management today.